This is a cake I had made for a number of years and then I somehow lost the recipe. When I remarked to my daughter recently that I wish I could find the recipe as I wanted to make it for our guests here at the farmhouse in Umbria, I was very pleased to find out that she had actually kept a copy of my recipe. It is in fact a recipe adapted from a Cooking Light magazine, and I believe it was the very first Cooking Light recipe that I had ever tried. It is an easy basic cake that is perfect for breakfast or for a mid morning break with a cappuccino. It is a very simple cake to make and always gets rave reviews because it is so very moist and not too sweet. The cake contains light cream cheese to replace much of the butter which works out beautifully. I love cinnamon so I add an additional teaspoon into the cake batter as well as the topping. You can use either an 8-inch or 9-inch pan. Obviously the cake will be smaller but taller in the 8-inch pan, and you will need to cut the baking time by 5 minutes if you use the 9-inch size pan. Light cream cheese is used in place of much of the butter which keeps the cake nice and moist while reducing calories from fat. 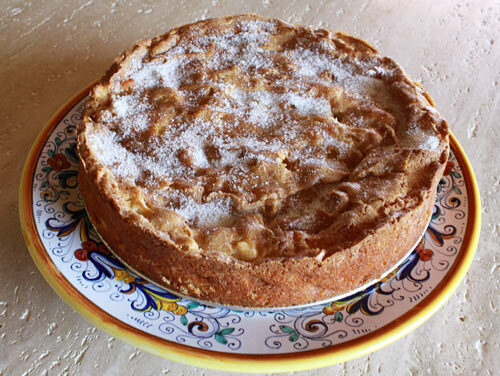 A very moist cinnamon flavored cake that is studded with apples. Adapted from Cooking Light. Lightly grease an 8 or 9 inch spring-form pan. Beat together the butter and sugar until light and fluffy with a hand mixer. Add the cream cheese and vanilla and continue to beat until smooth. Add the flour, cinnamon, baking powder and salt and beat at low speed just until mixed. Fold the chopped apples into the batter and pour the batter into the prepared pan. Mix together the remaining 1/4 cup sugar and 2 teaspoons cinnamon and sprinkle this mixture over the batter in the pan. Bake for 35 to 40 minutes, or until the cake begins to pull away from the pan and a skewer poked into the center comes out clean.